Day 7 of End of April Beginning of May, the last day, was a picnic. Chun-liang and I had the idea to end with a picnic for guest artists and audiences very early on in the planning of this project (we’d been planning this since November 2014), and for me it was a significant way to end. I think most people who attended this final day, or who were present at the State Library, were unsure whether it was a performance or not – I don’t know the answer to that, either. People did strange things, and everyday things. People made strange sounds, and everyday sounds. I remember one point where three of us were reading books aloud (Shani Mohini-Holmes read from Finnegans Wake, I read from Ulysses, and Ren Walters read from Cage’s Silence), and at the same time about 3 or 4 conversations were going on around us. It was one of the sonic highlights of the week for me, and it also represented an aspect of the project that had emerged somewhat unexpectedly throughout the week – the social aspect. After every performance, Chun-liang and I had coffee and/or a meal with audience members and guest artists. These social events had no agenda, but often we discussed the performance just gone, how the project was going, or a range of other things, over long breakfasts or lunches, or late night drinks/meals. As the week went on, I appreciated these times more and more. For me, improvisation is inherently a social activity; an interaction between individuals; and these social gatherings seemed an extension of this activity. They were also forums to debrief, for reassurance and support. I felt very vulnerable many times throughout the week, either because of confrontations during performances, or just general exhaustion There were a few key moments for me in these social gatherings of important support from fellow performers, but also from audience members and friends. But like our performances, these were not all non-stop joyful experiences! Like any social occasion, there were awkward and tense moments as well. Like improvisation. Like life, really. Sometimes, I think that I don’t completely comprehend what Chun-liang is doing in her performance practice. But I am fascinated by it, and sometimes frightened as well. She claims she is not a dancer, and I often answer that she is more than a dancer. The social aspect is, for me, a big part of what Chun-liang does. Indeed, interaction was a conscious aim of this project. During End of April Beginning of May, she danced and moved and existed in a public space, and sought interaction with strangers and passersby. Every time I saw her approach someone, I felt scared. I’m not exactly sure why. We have had heated encounters with passersby at public space performances before, but this wasn’t exactly what frightened me. Chun-liang approaches people with trust and openness, and this could be seen as an inherently vulnerable position. I feel that vulnerability was a big part of what we did that week. I certainly felt vulnerable in performance as well. But maybe there is a power in this vulnerability, this openness. The people Chun-liang approached and interacted with often seemed disarmed and taken aback by her. That the majority of people seemed to react in a positive and friendly way to her is something worth considering, especially for someone like myself, who often has assumptions about people and their attitudes. As for myself, I’m still not really sure what I learned. Maybe that I could complete such a demanding project, but not without challenges; especially the psychological and emotional ones that seem to be amplified in these situations of heightened vulnerability. Musically/sonically, I have no idea if what I contributed was successful or not, but in some ways I don’t think that’s the point. 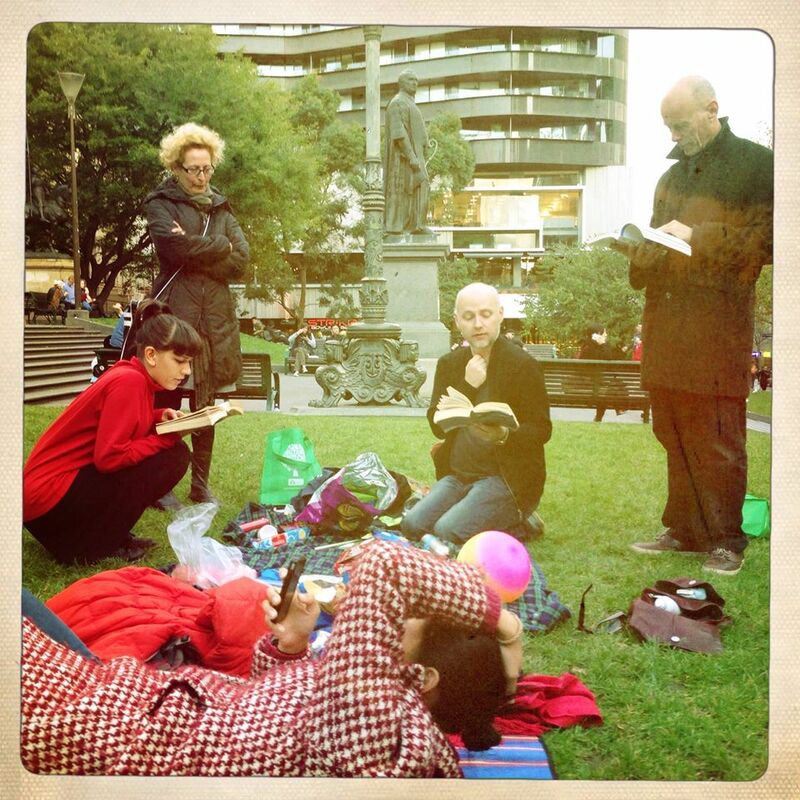 Instead, I hope those sounds found a place in the often cacophonous public space that is the State Library forecourt, that we were either harmonious or discordant. That the sounds existed there, and then were gone. Because we were there, Chun-liang and I. We were there for 7 days. Ha Clinton I didn’t really “sought” interactions. They just came to me mostly, except for Wednesday. And thanks about the comment on the vulnerable thing!